This dissertation studies the interpretation of plural sentences and its connection to conceptual information in the human mind. The main claim is that conceptual information on content words can affect the logical interpretation of complex plural sentences, unlike what traditional formal semantic studies of sentence meaning would expect. It is argued that this interaction is governed by a new principle, the Maximal Typicality Hypothesis, which is developed using insights on concepts from cognitive psychology. Two types of plural sentences are studied experimentally: reciprocal sentences and sentences with predicate conjunction. A series of experiments - both behavioral and neurolinguistic - demonstrate that the interpretations of these constructions vary systematically between speakers and between situations. The Maximal Typicality Hypothesis uses conceptual information on verb concepts to determine how acceptable plural sentences will be in a given situation. This is done by singling out one situation as the core situation that is described by a sentence. The core situation is an optimal ‘compromise’: the situation that is maximal for the sentence among the situations that are most typical for the concept(s) within it. The experiments that are reported in this dissertation show that the MTH successfully accounts for the acceptability patterns of plural sentences in different situations. 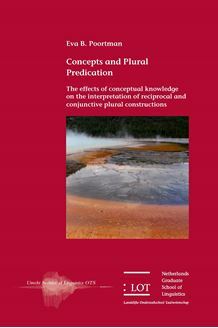 This marks a substantial advance in the analysis of plurals, and starts to bridge the gap between semantic theories of language and cognitive theories of concepts. This book is of interest to linguists working on plurality as well as psychologists working on the structure of concepts. More generally, it is relevant to scholars from any field who are interested in the general topic of how language use and concepts in the human mind are intertwined.